We dug into the ingredients of 96 popular baby formulas and found four powders that are closest to the real deal. A lactose-only formula and additional “superfood” ingredients make this one of the closest replicas of breast milk out there. The priciest of our picks: $40 for 20.5 ounces ($1.88/ounce). A similar profile to Enfamil Enspire, with a few notable exceptions: Its lactose base is supplemented with other sweeteners, and it lacks "superfood" ingredients. Budget-friendly: $29 for 32 ounces ($0.91/ounce). If your baby’s tummy requires soy instead of lactose, this one’s GMO-free and far less sweet than other soy options. It’s also the most budget-friendly of our top picks, ringing in at $23 for 26 ounces ($0.89/ounce). 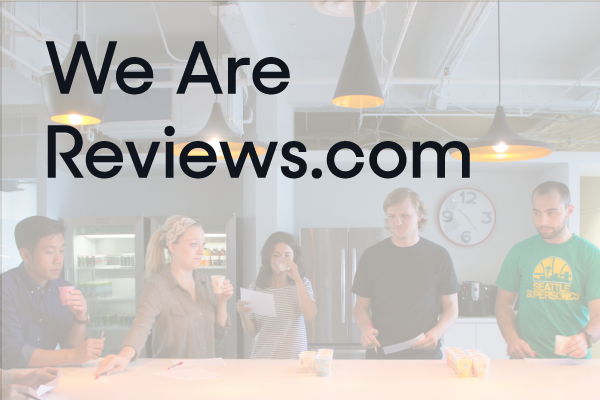 February 15, 2018 - We revisited our top picks to verify that their ingredients hadn’t changed since we first wrote this review. Accordingly, we changed just a few small details: Kirkland’s formula no longer includes probiotics/prebiotics, and Target’s no longer lists its formula’s ingredients online The price of almost every pick had changed, so we updated those numbers as well. We also rewrote existing content to provide clarity (especially concerning whey: casein ratios), provided research and resources for readers to access — including a term glossary — and added a recommendation for Gerber’s ready to feed formula, which shares its composition with the powder formula we already vetted and recommended. Finally, we got an expert’s opinion on breast milk supplementation and included her advice in this update. January 24, 2018 - For this update, we clarified our methodology and updated information about our top picks. We also removed Plum Organics from our top picks and replaced it with former runner-up Earth’s Best Organic, whose new formula contains additional prebiotics. Keep an eye out for further testing in the coming months — we’ll be taking a closer look at both of them. The good news when it comes to picking the best baby formula is that you can't really go wrong — they're all FDA regulated. The best formula for you will depend on what ingredients work best for your baby and what’s important to you when it comes to organics and enhancements. We consulted pediatricians and a food policy expert and analyzed ingredients to find top picks that best mimic breast milk. We’re guessing your search for baby formula probably started with something like this: “Yes, breast is best. But I’m not able to breastfeed — or at least not exclusively. So now what?” Rest assured, you’re not alone. According to the Centers for Disease Control and Prevention, just 16 percent of American infants are exclusively breastfed for their first six months of life. All those parents who feed or supplement formula are looking for the same thing: what’s best for baby. 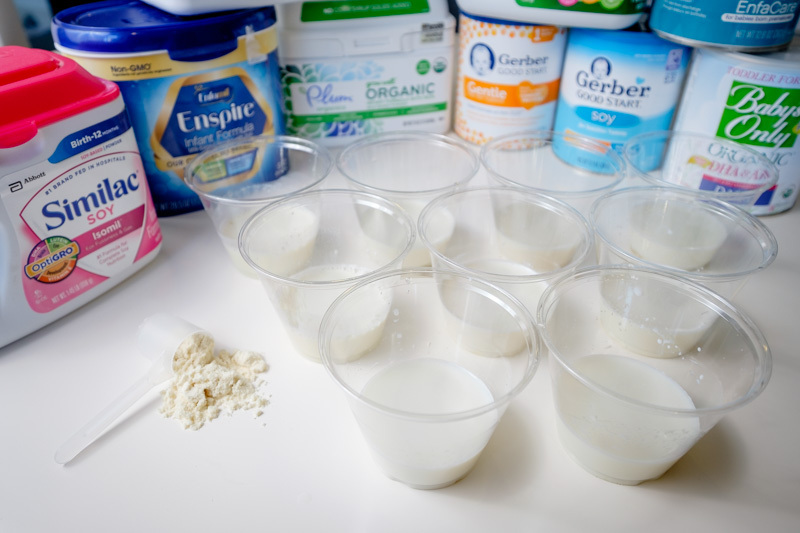 Because the FDA regulates all baby formula, any formula you pick is safe to feed your baby, but there are nuanced differences from formula to formula that affect taste, consistency, and ease of digestion. Ultimately, the formula your infant likes the most is the one that’s best for you. Confused by ingredient jargon? If you find yourself asking "Wait, what does that mean again? 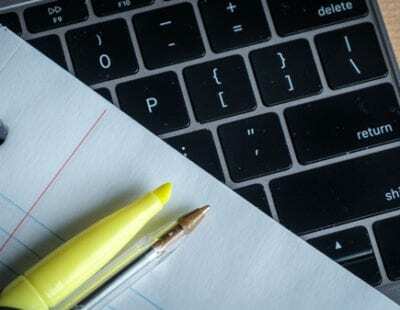 ", reference the glossary at the end of this review. If you’re looking for a great formula to get started, we recommend Enfamil Enspire Powdered Baby Formula. It includes the most extra goodies to mimic breast milk, like pre- and probiotics, plus a couple of “superfood” ingredients not found in any of our other top picks. Another standout: Its only sweetener is lactose, as opposed to the corn-based ingredients found in lots of baby formulas, minimizing the amount of sugar your baby consumes on a daily basis. The downside is that it’s expensive, ringing in at $39 for 20.5 ounces — that adds up fast. Our more budget-conscious pick is Gerber Good Start Gentle Powder Infant Formula, another cow’s milk formula. It’s a friendlier $29 for 32 oz, but you’ll sacrifice some things we loved about Enfamil. Gerber’s corn-based sweetener isn’t as close to the real deal, and its formula doesn’t have the “superfood” ingredients of Enfamil, either. 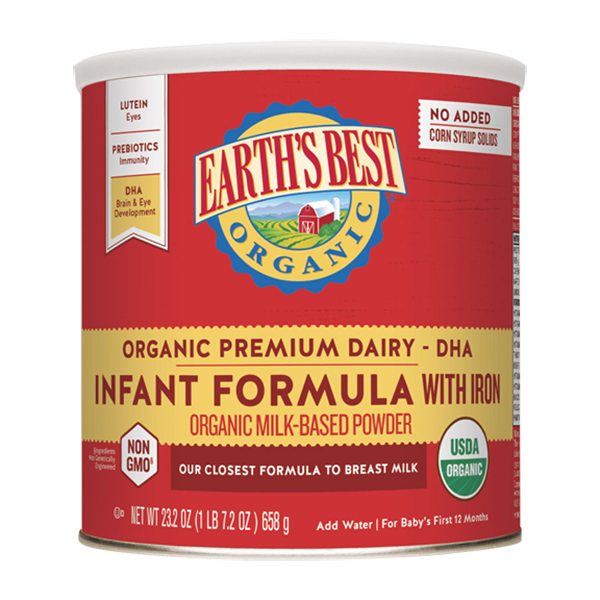 For an organic option, we prefer Earth's Best Organic Infant Formula ($27 for 23 ounces). Earth’s Best stands out for using organic lactose (found in breast milk) and nothing else — other sweeteners show up in pretty much all of its competitors, including the popular brand Honest Co.’s Organic Infant Formula. It also features additional prebiotics. The only downside? This lactose-based formula is relatively new, so it may be hard to find at your local grocery store. 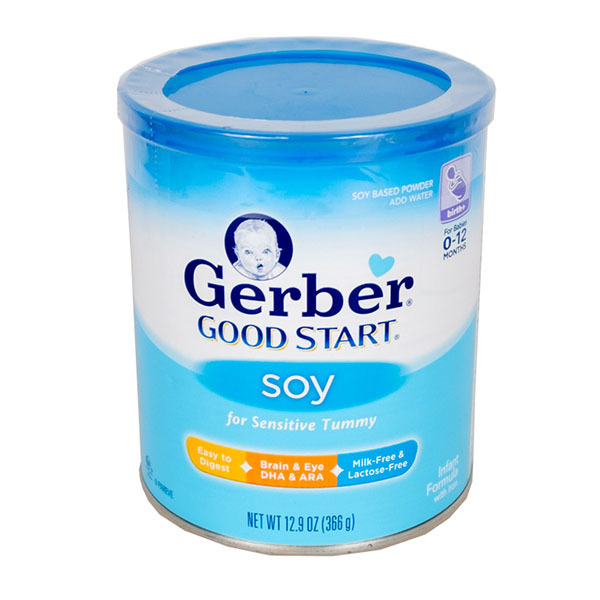 If you’re searching for a soy-based formula, we like Gerber Good Start Soy ($23 for 26 ounces). It’s one of the only formulas we found that uses non-GMO soy. It also relies more on corn maltodextrin than sucrose for its sugar, and is therefore less sweet than many of its soy-based counterparts. To narrow the pool from over 90 products down to the handful we recommend, we read through scientific studies and consulted with pediatricians and a food policy specialist to get a broad range of viewpoints. Our process is below — but remember that your own doctor is the best source for finding what’s going to work best for your own baby. First, some important baseline knowledge: All baby formula is safe. There is a surplus of infant formula on the market — our initial list included a whopping 96 options — and all of them will be baseline adequate. “Unlike most other foods, the government makes sure you’re getting a nutritionally adequate product” with formula, says Charlotte Vallaeys, senior policy analyst for the Food Safety and Sustainability Center at Consumer Reports and contributor to its Greener Choices website. Thus, every commercially available formula has the same basic mix of protein, fats, carbs, and essential vitamins and minerals. Many formulas are also enhanced with additional fatty acids and beneficial bacteria, and the vast majority are iron-fortified, which is the strong recommendation of the medical community. The goal of all baby formula companies is to mimic breast milk; it’s the gold standard by which they are measured. “Breast milk is an infant’s natural food, a living food that has hundreds or thousands of nutrients and components, many of which scientists haven’t even identified or understand fully,” says Vallaeys. The American Academy of Pediatrics, World Health Organization, and tons of other groups agree, and research shows that breastfeeding has many health benefits for both infants and nursing moms. Our mission: try to find out which formula best matched breast milk. We rounded up a list of powder formulas — the most cost-effective type. Why powder? The ingredients lists for different versions of the same formula — powder, liquid concentrate, ready-to-feed — are virtually identical. 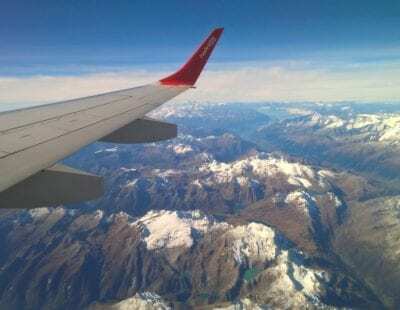 Powder is the most common and most affordable. With the others, you’re mostly paying for convenience. We recommend them if you’re going somewhere without a clean water source (say, camping) or if you’re not giving formula very often. One of our top picks is available in ready-to-feed form, but we narrowed in on powders for the bulk of our research. We preferred formulas that rely on lactose as a sweetener. Research shows that, like adults, babies prefer sweet tastes. Breast milk gets its sweetness (and simple carbohydrates) from lactose, but lactose can be expensive. As a result, many formula makers have switched to lower-cost plant-based sweeteners, including corn syrup solids, glucose syrup solids, maltodextrin, and cane sugar or sucrose itself. The type of sweetener isn’t necessarily an issue — though we prefer lactose anyway, since it’s what’s in breast milk — but how sweet it tastes could be. Curious about sweetness levels in your formula? This handy chart shows relative sweetness as compared to sucrose. One prevailing concern is that overly sweet formulas will lead to infants developing a taste for extra sugar as they get older, which is widely linked to obesity. An NBC investigation found that some formulas have much higher levels of sweetener per gram than others. A separate investigation by The New York Times into the sweetness of a popular organic brand formula found that it was as sweet as grape juice. We favored those that use lactose as the main sweetener — at least in dairy formulas. We also sought out formulas designed for easy digestion. There are two factors that can make formulas easier for babies to digest: hydrolyzation and a good whey-casein ratio. Partially hydrolyzed formulas give tiny tummies a head start in breaking down proteins. “Partially digested formulas are excellent for irritable babies,” says Pediatric Gastroenterologist Dr. Stan Cohen — though not for babies with true allergies. Many infant formulas also now include prebiotics (usually galacto-oligosaccharides) and probiotics (beneficial bacteria). Probiotics promote healthy digestion, while prebiotics can strengthen immune systems. Both show up naturally in breast milk, and in large quantities. Research is positive about these enhancements. For example, studies show that probiotics can help babies with diarrhea and viral tummy troubles, while prebiotics might help babies grow good stomach bacteria that’s similar to a breastfed infant. In the fight against fussiness and the quest for a happy baby, prebiotics and probiotics could help. We gave points to formulas that include them, and the majority of our top picks contain one or both. We wanted to consider the whey-casein ratio. Breast milk contains two types of protein: casein and whey. The ratio of whey:casein fluctuates between 70:30, 80:20, and 50:50 throughout lactation — while cow’s milk is about 82 percent casein. Whey, the star of breast milk protein, is easier to digest than casein. In the ‘60s, companies started adding more whey to bring formulas in line with breast milk. Unfortunately, it’s not possible to tell a formula’s exact ratio; companies aren’t required to share it. The best you can do is infer from an ingredient list. Ingredients are listed in descending order by weight. If cow’s milk is listed first, followed by a whey protein — or if whey protein is listed first — there’s a better chance that the composition is close to breast milk. And we required non-GMO ingredients. Given the potential risk for even small amounts of pesticide residue, we required our top picks to use non-GMO ingredients. We brought in formulas with a variety of protein sources and mixed them up. The main protein sources you’ll find in formulas are cow’s milk, soy, and a protein hydrolysate (protein that’s been broken down into tiny pieces). Cow’s milk is best for most babies, because it’s closest in structure to human breast milk. As a result, our two top picks are both cow’s milk formulas. In rare cases, babies are born lactose intolerant or with milk allergies. With cow’s milk out of the picture, a doctor will likely recommend a soy-based formula. We have a pick for that, too. After making our ingredient cuts, we brought in the most promising baby formulas from a variety of protein sources — leaving options for your (and your baby’s) preferences. We wanted formulas that make feeding as easy as possible for new parents. So we put ourselves in their shoes and scooped and shook to test each for ease-of-mixing and consistency. In the end, our top picks gave us the best results. One of the only formulas that is enhanced with the “superfoods” lactoferrin and MFGM. Plus, lactose is its only sweetener. 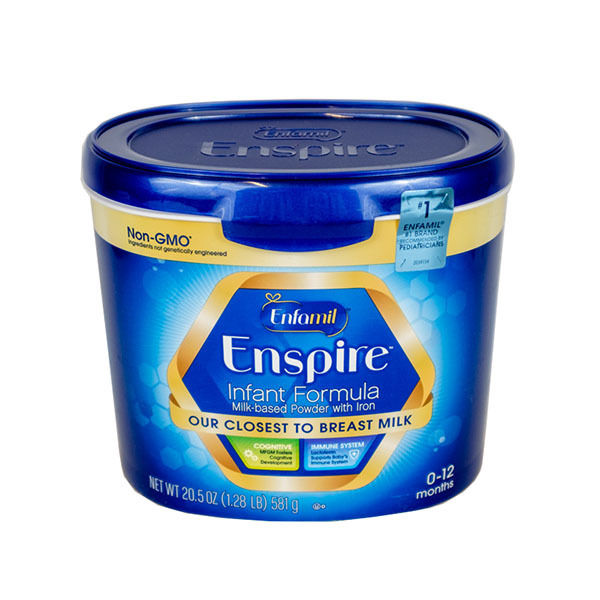 Enfamil Enspire is designed to digest easily and does a remarkable job tailoring its ingredients to get a little closer to breast milk. This starts at its source of protein: cow’s milk. 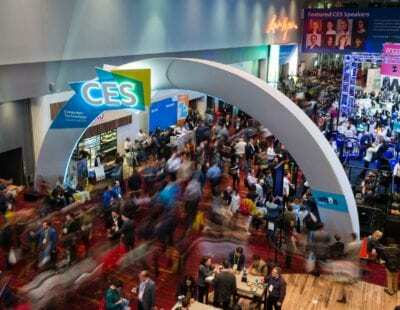 But what really makes Enspire stand out are two relatively new enhancements to the US formula scene, lactoferrin and milk fat globule membrane (MFGM). Lactoferrin is a protein that occurs in high amounts in breast milk and especially in colostrum, the first “superfood” milk that’s produced after birth. Lactoferrin has been widely used in formula in other countries, and the FDA recently added it to the list of approved ingredients in the US. Studies point to it being helpful in digestion, bringing stool consistency closer to that of breastfed babies. Similarly, research on MFGM shows that babies who consume it in their formula show similar advantages in development as those of breastfed babies. 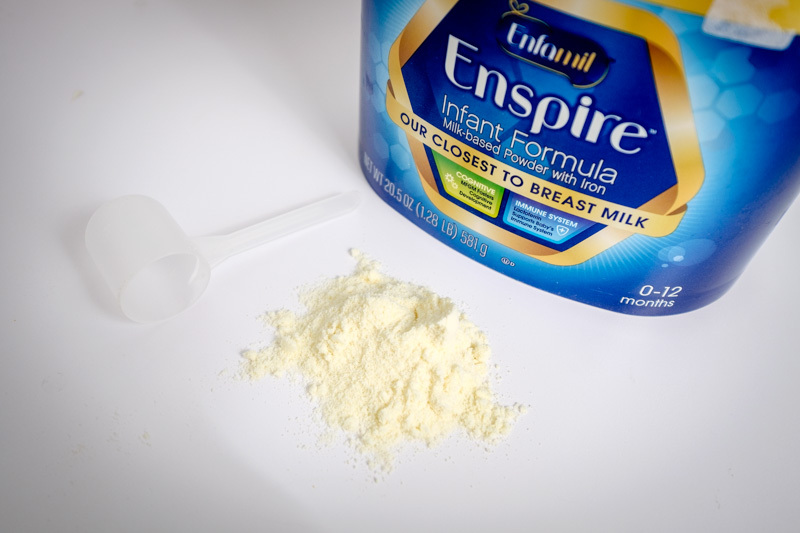 Enspire also adds prebiotics and probiotics to help encourage beneficial bacteria in the gut and get closer to the profile of breast milk. Plus, it’s one of the only formulas we found that uses lactose as its only sweetener — the same as in breast milk. That’s a rare bonus, given the cost of lactose versus corn-based sweeteners; of our top picks, Enspire is one of only two that does this, which explains its heftier price tag. Enspire also guarantees non-GMO ingredients, which confers many of the same advantages as an organic label. In our hands-on testing, Enspire also came out on top. It was milder-smelling than the other formulas we looked at, and it was easy to mix into a creamy consistency — comparable to half-and-half. We only wish Enspire’s formula was available at a lower cost. At $39 for 20.5 ounces, you’re definitely paying for those special additives. Our budget pick costs about half as much per ounce, but you’ll be sacrificing a few of Enspire’s exemplary ingredients. It may be pricey, but we appreciated Enfamil's packaging, including a resealable bag and a separately wrapped scoop. Looking to supplement breastfeeding, not replace it? When a mom is going back to work or isn’t producing the ideal amount of breastmilk for her baby, at least some formula may become a necessity. Deborah Malkoff-Cohen, a pediatric Registered Dietitian, gives us the lowdown on how to make an easier transition. Typically, the naturally occurring iron in breast milk is bioavailable and ultra-easy to absorb. An estimated 50% gets absorbed, Malkoff-Cohen says, so not much is required for a baby to get the right amount. However, in traditional formulas absorption is around only ~10% so manufacturers have to add more to overcompensate, which can be hard on a baby’s stomach. A breastfed baby’s bowel movements are typically soft, golden-colored and “seed-like,” but the iron in formula is harder to absorb, so more is required. This can lead to harder-to-pass stools and constipation during the transition from breast milk to adding some formula to the mix. Until now. Enter supplementation formulas and extra prebiotics. The FDA doesn’t have any additional requirements for formulas that include a reference to “supplementation” on their labels — all formulas, supplementation or not, have to be nutritionally complete by law. Because of this, we can’t guarantee that any given product with phrases like “for supplementing” is different than it’s regular counterpart. Malkoff-Cohen did tell us that at least one such product, Similac For Supplementation Non-GMO, contains about 10 percent more prebiotics than the regular formula. Those prebiotics help soften stool, cut down on constipation, and bring digestion closer to what a breastfed baby experiences. Looking at Similac’s label, it has all the right stuff: Its protein comes from cow’s milk, and lactose is its sweetener. If Mom’s going back to work soon or you’re looking for a nutritionally complete alternative when breastfeeding isn’t an option, it should keep the transition smooth. A lot cheaper for a little more formula. Its corn-based sweetener isn’t ideal, but it’s still packed with good ingredients. Gerber Good Start Gentle Powder Infant Formula is another great first formula for infants — and at $29 for 32 ounces, it’s cheaper than Enfamil Enspire for a larger container. Its base protein is hydrolyzed whey, which is just broken-down protein to aid your baby’s digestion. It also includes prebiotics, probiotics, and only non-GMO ingredients. The most notable difference between the two formulas, besides Gerber’s lack of lactoferrin and MFGM, is that lactose isn’t the only sweetener: Good Start Gentle is 70 percent lactose and 30 percent corn maltodextrin. The gentle in Good Start Gentle is a play at how easy it is for babies to digest. Interestingly enough, some formulas that purport to be gentler on digestion actually avoid lactose — Gerber’s main sweetener. That’s because there is staunch belief (or, at least, rampant marketing) that lactose equals fussiness. Enfamil Gentlease, for instance, lists corn syrup solids as its first ingredient and contains no lactose; Similac Sensitive also uses corn syrup solids, plus adds cane sugar. However, Dr. Cohen notes that true lactose intolerance is very rare in babies, and lactose is preferred as the sweetener naturally found in breast milk. Good Start Gentle’s 70 percent gave it an easy victory over other contenders at the same price point. Gerber’s Good Start Gentle formula mixed up easily and smelled similar to the Enspire. 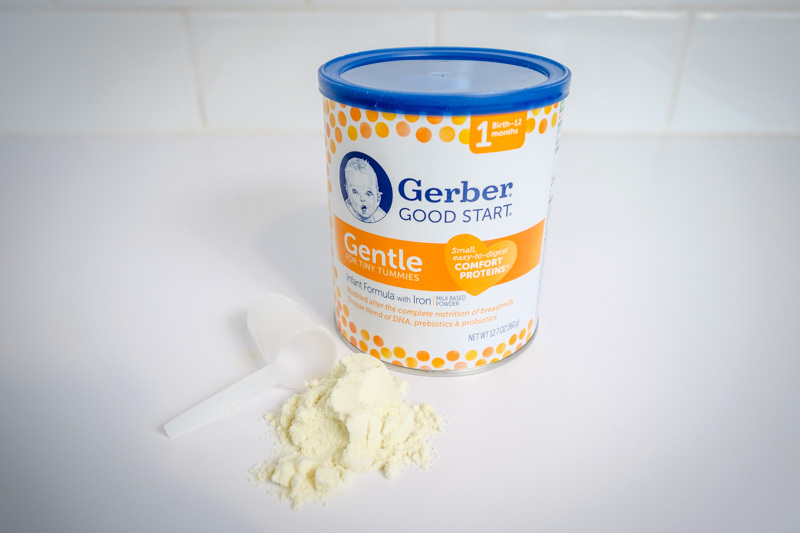 And here’s a bonus if you’re looking for the most convenient formula possible: Gerber is the only brand in our top picks that offers a ready to feed version of its powder formula. You can find it on Amazon in bulk for $0.20 per fluid ounce. 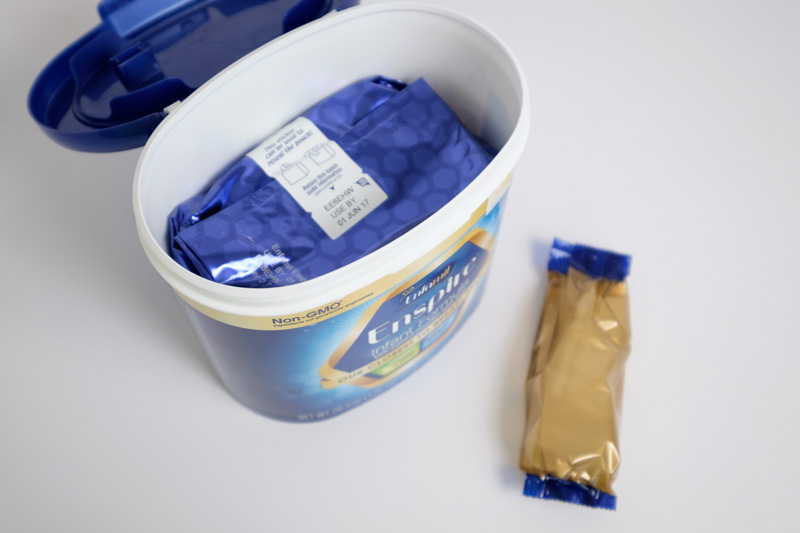 When we prepared servings of Enfamil Enspire (left) and Gerber Good Start Gentle (right), we found close similarities, with Enspire being a touch creamier. Earth's Best new formula also has organic lactose as its only sweetener. If you’re in the market for an organic formula, Earth’s Best is the way to go. Within the last year, Earth’s Best changed its organic baby formula to a lactose-only profile with additional prebiotics — something other organic formulas lack. Unlike the Similac Organic brand, it doesn’t contain any added cane sugar. And it stands leagues above brands like Vermont Organics Baby Formula and Walmart’s Parent’s Choice Organic Formula, which contain no lactose at all. We also appreciate that it won’t break the bank at $27 for 23 ounces: cheaper than our top pick, Enfamil Enspire. Before you spring for organic, it’s worth noting that organic labeling is a little tricky when it comes to infant formula. All formulas have added vitamins, minerals, and enhancements — they are mandated by the FDA — which are synthetic, or derived synthetically, so they can’t be considered organic. In practice, an organic label on baby formula applies only to the protein, carbohydrate, and fat components of the formula (for instance, organic milk as a protein base, organic vegetable oil as a fat, and organic cane sugar as a carbohydrate). Popular brand Honest Co. suffered a lawsuit over that distinction, but all organic baby formulas play by those rules, including Earth’s Best. Note: Earth’s Best’s previous formula, which contains glucose syrup solids as well as lactose, is still for sale with other retailers like Walmart and Target. We suggest buying the lactose-only formula straight from the manufacturer, at least for now. A non-GMO soy formula that isn't quite as sweet as most of its competitors. For babies with a milk protein allergy or lactose intolerance, soy formulas can be a doctor-recommended choice. Granted, these conditions are rare, and most doctors recommend starting with a dairy-based formula because its proteins are closest to that of human milk. If you have a family history of milk allergies, that’s when you should talk to your baby’s doctor about starting on a soy formula. 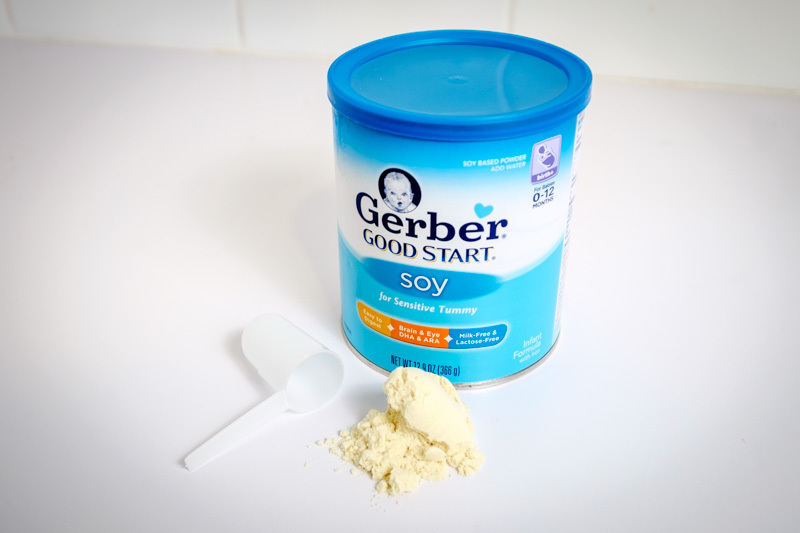 We like Gerber Good Start Soy because, like all of our top picks, it’s extra-gentle for babies: The soy protein is partially hydrolyzed to ease digestion. It’s also one of the only soy formulas to use non-GMO soy and milder sweeteners. Its primary sweetener is corn maltodextrin, plus some sucrose. We prefer it to Similac Soy Isomil, another popular option, because it has less sucrose, and maltodextrin isn’t as sweet as corn syrup solids. In hands-on testing, this formula also smelled less pungent than the Similac. But be warned: Soy formulas are definitely stinkier than the dairy-based ones. At $23 for 26 ounces, it’s also fairly affordable. We should note, though, that Good Start Soy doesn’t include prebiotics or probiotics, unlike many of our other top picks — those additives in soy formula haven’t been clinically evaluated. Similar ingredients to Gerber, at sixteen cents less per ounce. 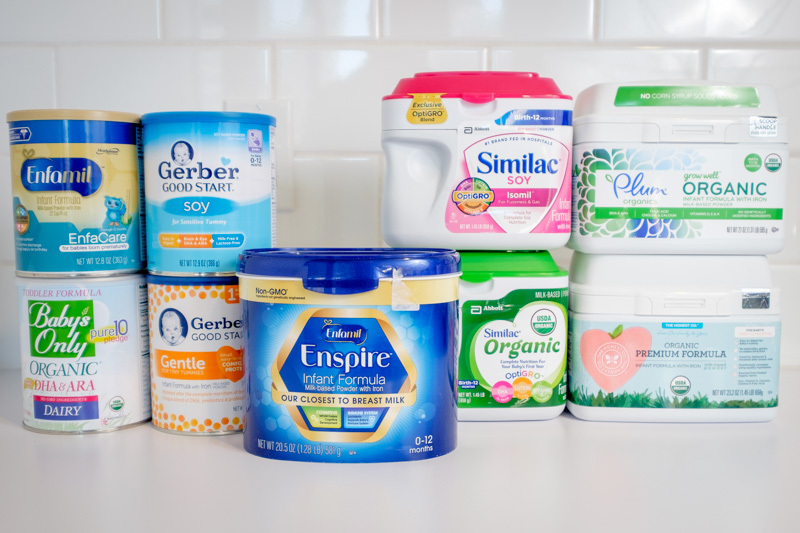 Companies like Costco, Walmart (Parent’s Choice), Target (Up & Up), Babies R Us, and many others manufacture their own store-brand formulas to replicate popular name-brand choices. Dr. Greer says that he recommends the generic brands to his own family members because they undergo the same testing and have the same essential nutritional components as name-brand choices. When considering store-brand options, look carefully at the ingredient list to make sure your preferences for protein source, sweeteners, and enhancements are included. 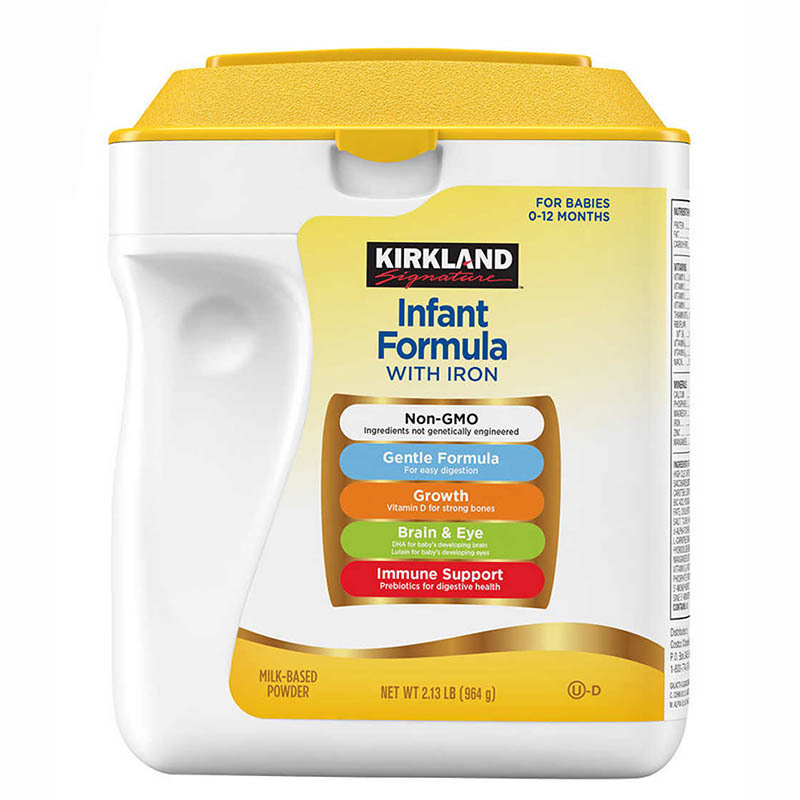 One of our favorites is Costco’s Kirkland Signature Non-GMO Infant Formula. Its ingredients compare to that of Gerber Good Start Gentle, with whey protein, added prebiotics, and lactose as the only sweetener. At sixteen cents less per ounce (around $25 for 34 ounces, or $0.74/ounce), it’s a pretty fantastic choice. One caveat: It doesn’t hydrolyze the milk protein like Good Start, so it might not sit as well in particularly tender tummies. *Enfamil Enspire also contains lactoferrin and MFGM. *** Costco’s Kirkland Signature baby formula uses non-hydrolyzed cow’s milk. 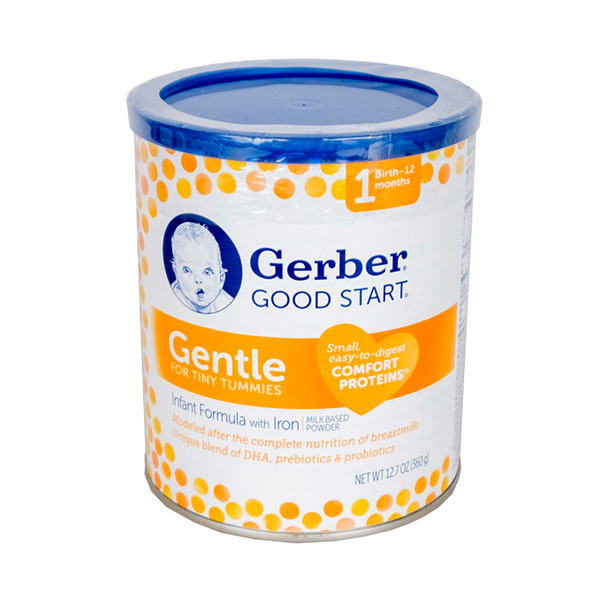 † Gerber Good Start Gentle is also available as a ready-to-feed formula. Babies shouldn’t drink regular cow’s or soy milk. Babies cannot absorb the right balance of nutrients from regular cow’s milk or soy milk, neither of which babies should drink in their first year of life. Breast milk or infant formula is all they need for breakfast, lunch, dinner, and snacks, at least for the first four to six months. At that point, many families start introducing solid foods. A milk allergy is different than lactose intolerance, but they’re both pretty uncommon. “A milk allergy is a reaction to a milk protein — most likely beta-lactoglobulin or casein, but it could be one of the whey proteins — while lactose intolerance is usually a milder reaction to the sugar in milk,” explains Dr. Cohen. He says that anywhere from three to eight percent of babies suffer from milk allergy, and of the two, a milk allergy will cause the more severe reaction. Symptoms of milk allergy can include rash, colic, nausea, and vomiting, any of which warrant a call to your doctor. DHA and ARA likely aren’t a cause for concern. These days, the majority of infant formulas are enhanced with docosahexaenoic acid (DHA) and arachidonic acid (ARA). These tongue-twisting ingredients may sound like scary chemicals, but DHA and ARA are just omega-3 fatty acids that occur naturally in breast milk and certain foods, like eggs and fish. In the vast majority of enhanced infant formulas, the DHA and ARA are extracted from algae and fungal sources. Some research indicates that this added DHA and ARA can help infant eyesight and brain development; other studies say that benefits are inconclusive. Nonetheless, they’re widely used in formulas, and the majority of the medical community agrees that they’re helpful. Dr. Cohen says, “I do emphasize that DHA is really important.” Because of this and their sheer prevalence, all our top picks contain these additives. That said, DHA and ARA are not without controversy. A chemical called hexane is used to extract DHA and ARA from their algae and fungal sources. This rings alarm bells for organic proponents because of the toxic nature of hexane. It is possible to use a water-extraction process, but the FDA has yet to study and approve this for infant formulas. Vallaeys notes that the National Organic Standards Board actually voted not to allow DHA and ARA extracted with hexane in organic infant formulas, but the USDA has not enforced this. These days, it’s difficult to find a formula that doesn’t include added DHA and ARA, but if you are concerned about the issue, The Honest Company Organic Premium Infant Formula is a good choice. If your formula isn’t agreeing with your baby, you’ll know. You want to find a formula that your baby enjoys and digests easily. Are they content and thriving, or suffering from digestive issues? You’ll know it: Food response will directly affect your baby’s sleep and mood (and yours, too, most likely). Babies with food allergies or digestion troubles will show signs like diarrhea or constipation, gas, reflux, dry or red skin, or chronic fussiness. Dr. Cohen recommends trying one brand at a time. When switching, he emphasizes going slowly and giving it time. “Substitute one new bottle in the middle of the first day, adding one more new bottle each day until the new formula has replaced the old.” It can take a week to see changes in irritability and up to 30 days to see a difference for allergic rashes.